This stealthy fixed-blade combat knife features a hefty stainless steel blade with a heat-treated black finish, a blood groove, bullet-shaped cut outs and partial serrations, making this bad boy one more rough, tough fixed-blade combat knife. The composite handle offers bullet notches and the non-slip grip required of quality combat knives. It features exposed tang on the end of the handle with a cord lanyard attached to it. The handle also houses the bullet pocket folder, which features stainless steel construction with a copper-tone tip. A bayonet-style guard gives this fixed-blade combat knife a serious tactical edge and only adds to the design. 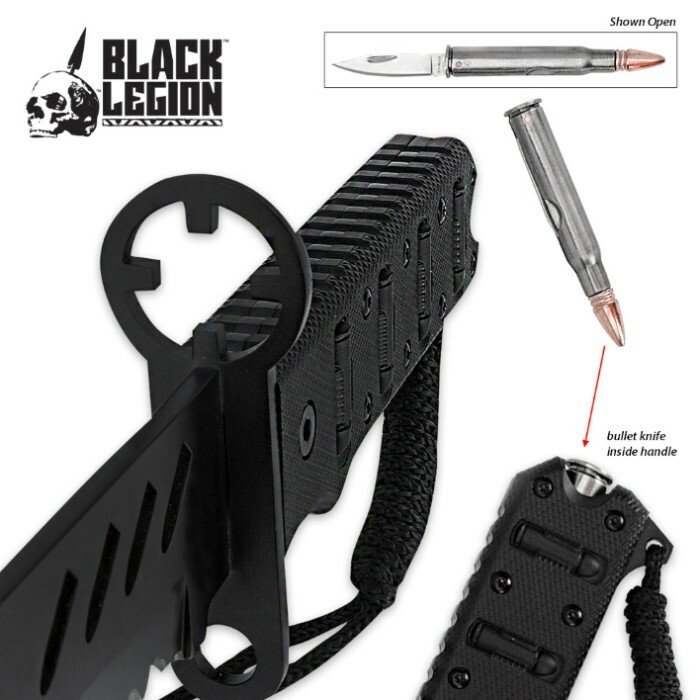 It's a capable size at 12" in overall length, and it includes a heavy-duty nylon sheath. Great knife. Bullet knife is a bit dull made of lower quality metal but it's really just for the thought. The main blade is like usual for Black legion. Great quality good sharp edge right out of the box. Worth adding to the collection. To my surprise this blade turned out to be a quality cutting device. Good size and robust with a decent handle and heft. Has considerable aesthetic appeal with the all black look. To be completely honest the tiny bullet knife nestled in the handle is basically a novelty item although some creative soul will likely find a good use for it. The sheath seems OK in my limited use so far. 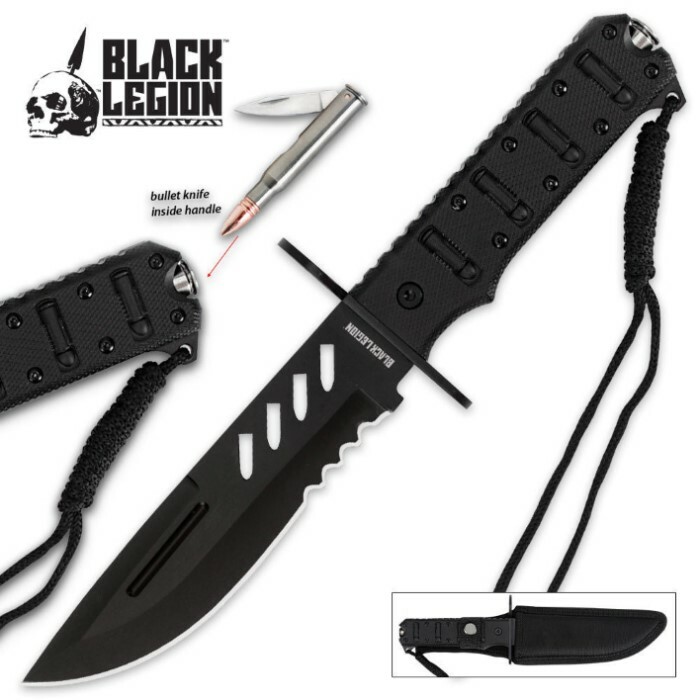 If you are in the market for a blade of this design, size and style you really owe it to yourself to look closely at this Black Legion Covert Combat Bullet knife. This knife is awesome and ready to use out of the box. Only complaint is the clasp on the sheath gets stuck sometimes. I don't usually write reviews but this knife warrants it.It is well balanced,heavy,thick&razor sharp out of the box.If you're looking for an all around combat knife this is it. I got this knife awhile ago, but I decided to write a review now. I like this knife quite a lot. I will absolutely buy again from this site, however the price to ship to Australia is pretty high.